Waited for folk to get out of shot. A view to the bits you can't walk to. 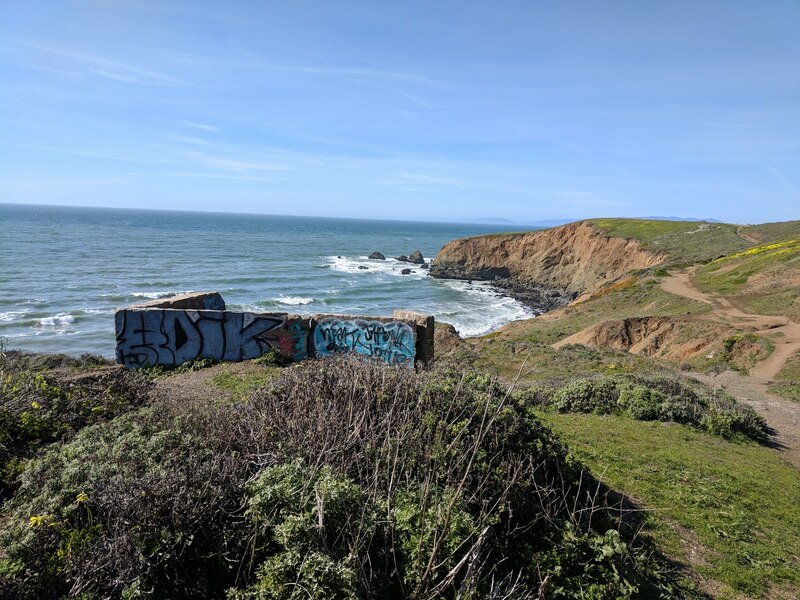 I took a walk up to Mori Point yesterday & took these photos. The coastline is stunning; I never tire of looking at it. Even that graffitied bit of old, I'm assuming, WWII bunker looks lovely. When I was a youth, Mori Pt. was only really accessible by the well worn foot paths made by locals. Many of whom were teenagers looking for a secluded spot to party, myself included. It was the 80s and we lived between the ocean and the hills. Having kegger parties out in nature was the fashion. Kegger at the beach. Kegger in the hills. You name it, we rolled a keg out to it or up it. Today, Mori Pt. is part of the national parks system. Paths have been widened & made safer, wooden walkways have been put in & signs with historical information have been erected. There's even a public toilet. It's very user-friendly and I appreciate that, but with regulation come a small cost. Now, EVERYBODY (and their 'free range' fidos that sometimes like to charge up behind you while you're hiking) from all over comes to town for a hike up Mori Pt. Its 'locals only' status long since gone. While I like that the area is now being maintained, I don't necessarily dig that the area is used by all and sundry. When your hometown becomes a tourist spot, well, it just feels a bit invasive. Living in other cities visited by scads of tourists never bothered me. Heck, I live in one now. But, maybe there's something to having one's small-ish hometown open up to the world that feels a bit funny. What was 'mine' is now everyone's. There are also no local businesses (yet) that cater to the growing numbers of Mori Pt. visitors. To be honest, there's not much in this area for locals either. People drive in, hike up, then leave. I guess the good thing about more folks out on these trails is that if one does have an accident while out hiking, there's always going to be someone around to call for help. Now if we could only get the dog owners to put their charges on leashes, we'd be golden. The only constant in life is change. Looks like a beautiful place to hike. Too true. Also: no more random keg parties for the local hooligans. Trouble much visibility. Wish I lived by the ocean. It's truly a gift. I missed the smell of salt air when I lived away from here. It looks like a truly lovely area. And I do understand the invaded feeling. Dogs on leads? Yes. And some pooper scooping doesn't go astray either. Yeah, it's pretty special. Dogs are great. Dogs on leads, especially as that is one of the park rules, are even better. Dear Bea, it's the dogs I would worry about too. Because of aging and Meziere's Disease, my balance is not good. So if a dog--or one of the cats with whom I live--get too close and tangle with my feet, I fall against the wall or to the floor. I lived in a tourist town in Minnesota for 36 years. I seldom went into the town because of the hoards of sightseers and shoppers. I shopped on the outskirts of the river town. Peace. Dee, I had never heard of Meziere's Disease until your mentioning it here. Yes, hiking up Mori Pt. wouldn't necessarily be enjoying with the off-leash dogs about.